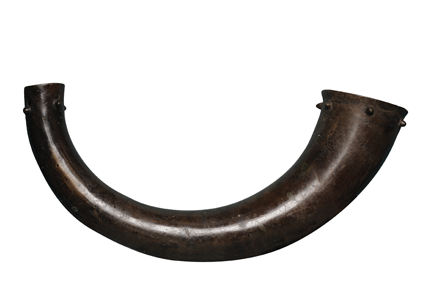 This Bronze Age horn from Lissroe, Co Kerry is about 3,000 years old and is one of my favourite objects. Until quite recently, the knowledge of how to play such horns was lost. The story goes that in 1857 museum curator Robert Ball gathered all his energy to play a Bronze Age horn but failed. It sounded like the bellowing of a bull but nothing like a war trumpet or musical instrument. He actually tried so hard that he blew a blood vessel and died shortly after! Recent experiments with replica horns revealed that it was possible to play music with them – but it took great skill. This is how we know ancient Bronze horn sounded very much like Australian didgeridoos. The Lissroe horn is currently on loan to Kerry County Museum from the National Museum of Ireland.